Tomorrow is Audi's big day at the 2010 Geneva Motor Show; many new highly anticipated models will make their official world debut. 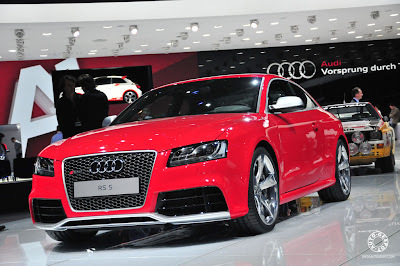 One such model is the Audi RS5. Here are a few "spy" shots of the Audi RS5 being prepped for tomorrow's official reveal, that were uploaded to Autogespot. Be sure to check back tomorrow for full Geneva coverage of Audi's entire showcase.